New Caledonia made the best start possible to their first OFC Women’s Nations Cup match in 35 years, beating Tahiti 4-2 in a thrilling, fast-paced encounter at Stade Yoshida in Koné this evening. Three-time finalists Papua New Guinea also started strong with a comprehensive 5-0 victory over Samoa in the opening match of the competition earlier in the afternoon. New Caledonia started with a bang, striker Jackie Pahoa just putting her effort wide of the upright in the opening minute. It was the kind of start that indicated the host’s intentions – to earn a respectable result playing in this particular competition for the first time since the inaugural edition in 1983, and the first time on home soil since the 2011 Pacific Games. New Caledonia coach Kamali Fitialeata said he couldn’t have asked for much more from his players than what they offered on the field this evening. “It’s a good start. I’m proud of what they produced on the field tonight, I can’t be anything other than proud of them,” Fitialeata said. New Caledonia dominated the opening 25 minutes scoring three goals in fairly quick succession. Kamena Xowie was first on the board when she latched onto a free kick, dribbled into the box and unleashed a powerful effort past Tahiti keeper Vahinerii Puraga. She hit the ripe old age of 17 less than a week ago, but Jackie Pahoa showed great maturity in her performance as she struck twice in the space of three minutes to give her side a fairly comfortable cushion. New Caledonia then let their guard down somewhat which allowed a determined Tahiti side to pull themselves back into the encounter. First up was a wonderful header from Tahia Tamarii who nudged it just out of Lorenza Hnamano’s reach. Just before the break Niauea Hioe dragged the ball past the defender before unleashing an absolute rocket into the back of the net. Coming into the second half it looked like an equaliser was almost certainly on the horizon for Tahiti as they dominated possession and kept Hnamano working hard. New Caledonia eventually imposed themselves on their opponent as Shaya Hmeling played the ball through midfield before laying off a fantastic ball for Aurelie Lalie who drilled a shot low and hard from the top of the box to make it 4-2. Fitialeata gave credit to Tahiti for the challenging encounter. The New Caledonia coach indicated a change in tempo and the approach by the players and perhaps a little bit of comfort after going 3-0 up is what contributed to Tahiti being able to come back into contention. “The girls wanted to manage the match which wasn’t quite what I instructed them to do. “There were a number of opportunities which they (Tahiti) made the most of and that destabilised my team a bit and we gave them two goals. “There’s still more for us to learn,” he added. A loss was obviously disappointing for Tahiti coach Stéphanie Spielmann, but she was impressed with the performance and remains positive about Tahiti’s chances in the remaining matches. “Obviously I’m disappointed because we lost, and I think we could have done better. But, we have just come back to this competition and I think we saw some youthful errors and a lack of experience. “We shouldn’t have conceded the first two goals and I think we just woke up too late plus we had some chances we weren’t able to convert. “But we’ll be staying positive, there a still two matches to go and we’ll start focusing on the next game against Samoa straight away. In the earlier match it was a positive return to the international stage for Papua New Guinea who have been relatively inactive since a 2016 Olympic Women’s Football Tournament play-off match against New Zealand back in January 2016. Although both sides started reasonably well, with Samoa looking pretty comfortable in possession and even testing goalkeeper Faith Kasiray on a couple of occasions, it was Papua New Guinea who took the honour of the competition’s opening goal. Kasiray lofted the ball forward and as Mariecamilla Ah Ki tried to control on the bounce, striker Meagen Gunemba whipped the ball off her and slotted past an advancing Meripa Seumanutafa, in goal for the Samoans. PNG captain Sandra Birum’s quick thinking saw her win the ball in midfield, she then played through for Gunemba who powered the ball into the back of the net for her second goal just five minutes later. Former U-20 women’s captain Yvonne Gabong nipped in behind the defender to connect with a cross and head it neatly into the net in the 27thminute. 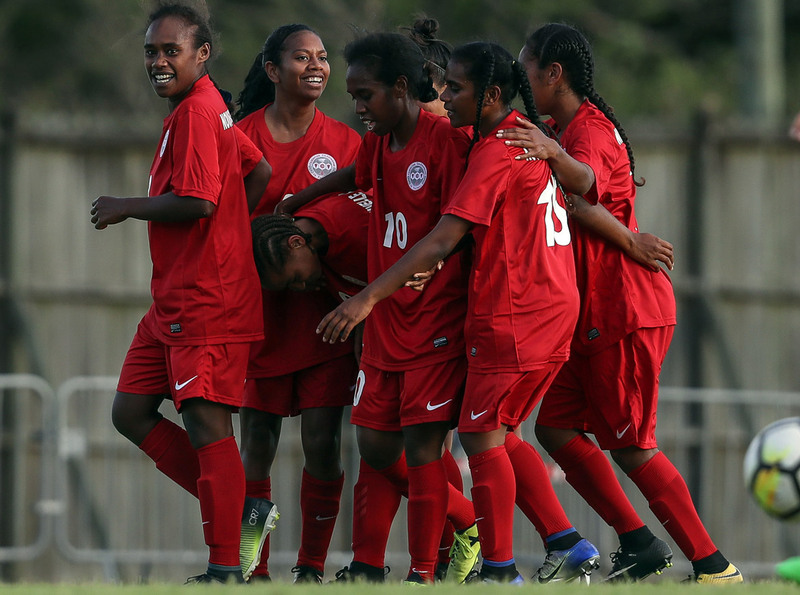 Samoa started to tire in the second half but continued to give their all on the pitch but Papua New Guinea were soon flexing their scoring muscles once more when Gunemba secured her hat-trick with a lob past the advancing Seumanutafa. The side then rounded out the encounter late in the second half when Marie Kaipu’s powerful shot came off the crossbar, falling neatly for Rayleen Bauelua to tap in. Papua New Guinea coach Peter Gunemba wasn’t sure what to expect going into the game, but thought his side met a strong opponent who made some trouble for his charges at times. “I was a bit surprised to see Samoa playing very well with good tactics, they hold the ball very well, but the execution was a bit of a problem for them,” he said of the opposition. But looking at his own side he had a couple of reasons to be proud. Daughter Meagen scored both the match, and tournament opener and went on to seal a hat-trick making for one happy coach, and proud father. “As a coach I’m very pleased with the players because we scored five goals but there’s so many things we need to correct to be a perfect football team. Making her debut as a national team coach, Nicola Demaine thought the commitment from her side was exactly what she asked for. “I asked them to give 100 per cent and I can’t fault them on that. Everyone out there when you see them cramping up they’ve obviously given 100 per cent. Samoa weren’t without their chances in the match and were incredibly unlucky to be denied by the woodwork at least on three occasions. Demaine’s response to that showed a loss didn’t dampen her sense of humour as she noted the goals “must be smaller in New Caledonia”. The OFC Women’s Nations Cup action continues tomorrow in Nouméa where the four Group B teams will get their campaigns underway at Stade Numa Daly.